Most of the players in the Class of 2008 have announced what school they will be playing college ball at next year. Many were there to see the game, and I'm sure most have seen the highlights at least once. But to me, these highlights never get old. Back when LeBron James was the #1 Junior and Carmelo was the #1 Senior in the country, they squared off. 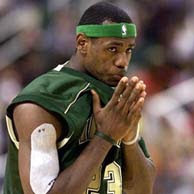 LeBron playing for St Vincent-St. Mary's against Carmelo's Oak Hill squad which consisted of all D1 players. Looking back Oak Hill Coach Steve Smith was quoted as saying, ''"I had never seen the crowd stand in unison at the end of the game and just start clapping in appreciation of what they just saw." LeBron James: 36 points on 12 of 27 shooting, eight rebounds, five assists, and six steals. Carmelo Anthony: 34 points on 14 of 25 shooting, 11 rebounds, and two assists in the 72-66 Oak Hill win. At the beginning of every summer, a few high school basketball players are hyped as the future, or the next great! After dominating their high school season the buzz begins and people start flying up the high school rankings. Eventually players from all over the country convene at AAU tournaments, ABCD and Nike All-American Camps so that questions can get answered. By the conclusion of the summer, we see many players fizzle out, while others begin to emerge. Looking back over the past 15 years, there have been so many great players flourish and take the thrown as king of the class. Epic battles have taken place, like in 1995, when Kevin Garnett, Stephon Marbury, Vince Carter, Paul Pierce and Ron Mercer all dominated their respective parts of the country. After breaking down all the players that have come through the high school rankings in the past 15 years, 10 stood out above the rest. In some instances, high school was the highlight of their career as college and the pro’s never amounted to anything. Others used high school as a stepping stone to become one of the greats. Was there anyone better? LeBron, maybe, but Kevin Garnett changed the game. Kevin began high school as a 6’6, pencil thin 9th grader immediately earning the starting nod for the Maudlin High School Mavericks. His game was beginning to take off and Kevin was starting to build a name for himself, when everything took a turn. In the summer going into Kevin’s Sr. year of high school, Kevin and 5 friends were charged with second-degree lynching (charges were later dropped). This prompted the move to Chicago where Kevin would flourish. When he arrived in Chicago, Kevin was a player possessed. He absolutely dominated averaging 25.2 points, 17.9 rebounds, 6.7 assists and 6.5 blocks per game as a senior leading Farragut Academy to a 28-2 record and the city championship. He owned the summer circuit, took home MVP of the McDonald’s All-American game and established himself as the prize recruit in the star studded 1995 class. After failing to qualify academically, Kevin decided to do something that had not been done in the 20 years prior. Kevin declared himself eligible for the NBA draft. This move would eventually open the flood gates for players like Kobe Bryant, Tracy McGrady and LeBron James to go straight from High School to the pros. Minnesota selected Kevin with the 5th pick and I think that it’s safe to say, the gamble paid off. An MVP in 2003 – 2004, 10 all star teams, 8 All-NBA and All-NBA Defensive Teams later, the “Big Ticket” has become one of the all-time greats. LeBron James is the most highly touted high school basketball player ever. As a 6’3 freshman LeBron led the St. Vincent-St.Mary's Fighting Irish to a perfect 27-0 record and their first state championship in over 15 years. LeBron was just getting started. During the summer LeBron continued to grow, literally, getting up to 6-7 and pretty much making himself unstoppable. Sophomore year was more dominance as LeBron captured another state championship. That summer was when things escalated, as LeBron went from the man in Akron, to the best high school player in the nation. 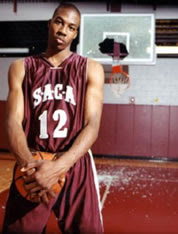 Lenny Cooke entered ABCD Camp with all the hype, but left known as the player abused by LeBron James. His stock took quite a hit as LeBron outscored the #1 player in the Sr. class, 23 – 9. LeBron had left his mark for the entire country to take notice. Junior and Senior seasons were more of the same for “The King” on the court, but the buzz off the court was getting out of control. St Vincent-St Mary’s was broadcasting home games on pay-per-view for $7.95, season-ticket packages for the Fighting Irish soared to $125, and the Fighting Irish made on appearance on ESPN. All was well, until the Ohio High School Athletic Association (OHSSA) started to investigate how the son of a poor mother was suddenly rolling in a Hummer and rocking expensive retro-jerseys. LeBron was eventually suspended, but the decision was ultimately overturned and LeBron was able to return in time to lead the Fighting Irish back to the state championship, their 3rd in 4 years. "100 pts in a 32 minute game - that's nuts"
There really isn’t much DaJuan Wagner didn’t accomplish in his high school basketball career. DaJuan was a scoring machine, putting up 27.3, 35.3, 31.9, and 42.5 points per game in his 4 year high school career. As a freshman, DaJuan absolutely burst onto the scene leading Camden to a South Jersey Group 3 championship. Being dubbed “The Messiah,” DaJuan had gone from legend in South Jersey to the consensus #1 player in his class. As a senior, Dajuan earned national recognition, after he dropped 100 pts in a 32 minute game. Despite the low level of competition, anytime you are able to shoot 42 of 61 and hit 10 from 3-point range, the future looks very bright. DaJuan ended up taking his game to Memphis, where he would meet up with his newly hired father, Milt Wagner. Yes, he was that good that John Calipari, not only hired his father, but also gave best friend Arthur Barclay a scholarship, to ensure DaJuan would bring his game to Memphis. It turned into a short pit stop as DaJuan declared for the NBA after a productive freshman season. After being selected 6th and having a solid rookie campaign, DaJuan was hit with serious health issues including severe colitis which led to the removal of his colon. He hasn’t spent much time in the NBA since. Last summer, the Golden State Warriors gave him a chance, but DaJuan appeared in just one regular season game before they decided to part ways. At only 24, it appears his NBA career is over for now, but he’ll forever be a hero in South Jersey. 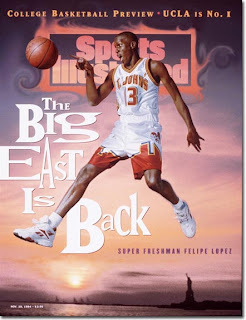 "Not many magazine covers followed"
When you’re put on the cover of Sports Illustrated without having played a college or professional basketball game, you must have dominated in high school and that’s exactly what Felipe Lopez did. Felipe came to the US when he was just 13 years old, from his native Santo Domingo, Dominican Republic. From the moment he stepped foot in the US, he began tearing up the NYC courts. 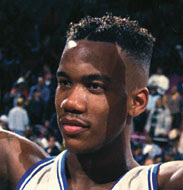 By his senior year he was heralded as the #1 player in the nation, and led Rice High School to the city championship. When put against the best high school competition, Felipe was the star among stars. Felipe earned MVP of both the McDonald’s High School All-American game after scoring 24 points, and the Magic Roundball Classic pouring in 25 pts, 11 assists and 4 steals. Expectations were so out of control for Felipe that it would have been nearly impossible to live up to them. After deciding to stay close to home and attend St. John’s, people thought Felipe was the savior for a program that was on a steadfast decline. His college career was solid (No. 3 on St. John's career scoring list), but certainly not what people envisioned. Following St.John’s, Felipe was the 24th pick of the San Antonio Spurs and ultimately traded to the Vancouver Grizzles. He was never a splash in the pro’s, bouncing around and eventually ending up overseas and playing CBA ball. Felipe has since retired from the game of basketball, but he’ll always be remembered as a High School Basketball legend. "The only title Steph will win at MSG"
It didn’t take Stephon Marbury long to gain national recognition. At age 11, he was touted by HoopScoop as the #1 sixth grader in the nation, and was creating his mark on the playgrounds outside of his Coney Island Projects housing development. By the time Stephon entered Lincoln, he already had a huge reputation. Many believed that Stephon would lead Lincoln to the New York City championship, something that eluded his 3 older brothers, who were also stars at Lincoln. Stephon’s high school career got off to a brilliant start. As a freshman, he was not only living up to expectations, but exceeding them, as Lincoln coasted through their schedule. Sophomore and Junior years were more of the same. By his Senior year, Stephon had achieved everything on the court except for the NYC Championship. He was not to be denied. As the final buzzer went off in Madison Square Garden, Stephon cried uncontrollably as he finally lead Lincoln to the title. He finished his high high-school career, averaging more than 28 points per game and 9 assists, and was involved in one of the biggest recruiting battles of all time. He would eventually choose Georgia Tech, but that was a one year stop on his way to the league. Depending on which way you look at it, you can argue whether Stephon has had a successful pro career. His numbers are unbelievable. Stephon is one of only 2 players to average 20ppg and 8assists (Oscar Robertson) throughout his career. Off the court, he got paid. Growing up in the Brooklyn projects and coming from nothing, to driving Bentley’s and getting contracts worth over $20 million per season is quite a feat. The flip side is Stephon is a career loser who nobody wants to play with. He is yet to make it past the first round of the playoffs and teams have had instant success the moment Stephon has been traded away. One thing is for sure, he’ll always have the high school championship that no other Marbury brother was able to bring home. To steal a line from my boy Bud, "this is simply one man's opinion." Possesses incredible ball handling skills… Great cross over dribble which he’s equally comfortable going left or right with. Has the ability to freeze his defender with a hard dribble, that he uses to get space for a pull up jumper (if the D sags back) or blow past the defense (if they tighten up). Demonstrates good body control when he gets into the lane. Plays with an attacking style, consistently penetrating to the basket and putting pressure on the opposition. He’s able to use his strong build (deceptive) to fend off contact when attacking the hoop. Has a scorer’s mentality, always looking to keep pouring it on. He’s capable of going off for big scoring numbers. Lacks the athletic ability to get above the rim, or elevate on his jump shot. Tyreke does not have the leaping ability which he’ll need as his game looks to advance to higher levels. Needs to repair his shooting form. It’s ugly, inconsistent and he has a slow release. Tyreke also tends to drift back rather than rising straight up on his jumper. Has to improve playing off the ball. Tyreke is at his best when he is isolated one-on-one, but he really struggles moving without the ball and finding other ways to score. Lacks point guard skills to run a team… Main focus is getting himself going. Needs to get better defensively. He has to get more committed on the defensive side of the ball and improve his foot speed and work on keeping his man in front of him. Tyreke is blessed with a ton of skills. He is very advanced with the ball in his hands and he can break down just about any defender off the dribble. His style of play is a treat to watch, because very few players have the ability to consistently penetrate to the basket, with a wide array of moves like Tyreke. He has a scorer’s mentality and can put up huge numbers any time he steps foot on the court. Because he is not very athletic, Tyreke will need to hone his skills for a few years in college, before he even thinks about entering the league. At 6’5, 200lbs, Lance has great size and a toned physique for someone only entering his Jr. year of high school. Extremely versatile on both ends of the court. Lance posses the handle which allows him to play the point forward, and the strength to bang inside. Also, he’s flexible enough to guard the 1 – 3 depending on match ups. Has the NYC swagger with confidence written all over his face. Very good finisher around the room. When Lance gets to the basket he can use his left, right, or throw it down. Fierce Competitor... Lance is at his best when he's playing against other elite players. When his body is squared to the basket, he displays a sweet shooting jumper. Has the range to hit from deep 3, but also the mid range game to hit from foul line and in. Solid athlete... Not an extremely high riser, but can definitely hold his own athletically. Needs to get more committed on the defensive end. Tends to leak out to half-court looking start the break. When things aren’t going well his immaturity shows as he pouts and point fingers. Has a tendincy to overdribble when he wants to break down his man and play to the crowd. It’s never easy when you are the next great superstar from NYC and dubbed “Born Ready” at the Rucker Park at such a young age. Lance has all the tools to become an elite NBA prospect very soon. He’s already sculpted like a pro veteran and he has the cross-over, versatility, and athletic ability which make you believe that the sky is the limit. Lance has to stay focused, keep practicing and not get complacent beating up on inferior competition. He also needs to grow up on the court and act like he’s mature enough to handle being a superstar. Lance would be best suited to play college ball far away from the distractions in NYC, to get ready for what has the potential to be a long pro career.